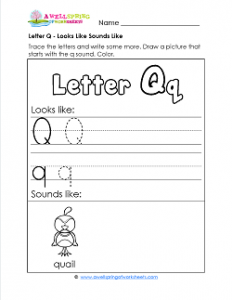 On this letter q looks like sounds like worksheet kids get to practice tracing the letter q – both the uppercase and lowercase ones. There isn’t too much space to write a lot of them so have them make sure they are their very best Qs. At least three of them, with a finger space in between if you so desire. Here’s a few things kids can choose form to draw next to the quail – quilt, queen, quarter. Coloring is required because that’s what makes it fun!